Clean and Classic Interiors » Blog Archive » Goodwill Parties and A Giveaway! Goodwill Parties and A Giveaway! While lounging on my couch and sipping my diet coke on a Friday night, (my kind of evening), I read a post through Wendy’s Frugal Friday Party by Therapy By Decorating which actually gave me the inspiration for today’s Thrifty Treasures Party at Rhoda’s and the Goodwill party at Sarah’s! If you know me, you know it took me 2 seconds to decide that I needed to head over to Target and get me some buckets! But no such luck. Ugggh!! Never Fear - Goodwill Was There! 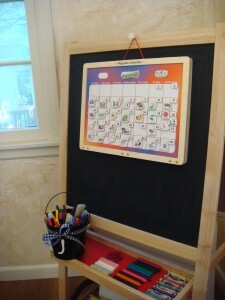 And with spray paint, a shaky letter J, and a cute little ribbon — it turned into a markers holder for the boys’ art easel. I don’t know if I love it more because it is so stinking cute or because it was so stinking easy to make? Probably both. My sister-in-law, Mindy, and I have officially opened our Etsy Store, Clean & Classic Embellishments, combining our two businesses. 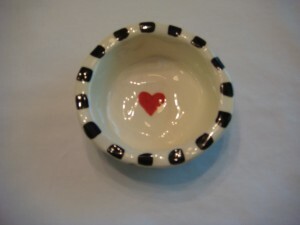 Although we have many handmade decor accessories, we are most known for selling our custom pottery embellishments. All clay items are custom made with the colors and design of your choice, hand painted, glazed, fired in our kiln and shipped to you! or adhered with epoxy to smooth surface. Along with the rosettes we make clay pinch pots, and soap dishes that are fun to have or give as unique gifts. Most customers like to use them to store jewelry, extra change, accessories and of course soap but if you can think of other ways, I would love to know! But with the welcoming of our new store, I thought one of our ‘Welcome Plaques’, similar to the one I have hanging on my porch, would be the perfect first giveaway! 1. Just leave a comment! (and just make sure you leave your email if you don’t have a site so I can let you know if you win). 2. If you have time to check out the store and let me know what catches your eye, I’ll enter your name again! 3. Sign up or let me know you have already signed up for my newsletter and you automatically get another chance! How great is that?! I will close the giveaway on Wednesday June 3rd @ 8am Central Standard Time. Thanks for entering and good luck to you all! I would love to win the Welcome sign in your giveaway! I just registered to get your newsletter and your new store has some super cute things. I love the soap dish and think it would be so cute with an initial in the middle! Love your stuff. Very creative. I did check out the etsy shop and I love the “Bon Appetit” sign. I collect fleur de lis so this caught my eye! Found you via the Goodwill party Mr. Linky! 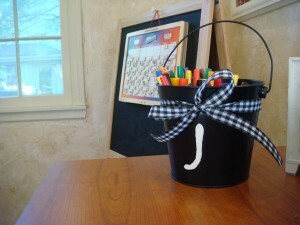 What a great little bucket idea and I would love to have my name in the hat for your sweet giveaway! 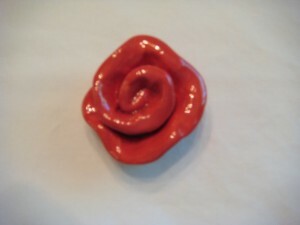 just went to your Sweet Etsy shop- I love all things roses so any of your rosettes are a hit with me! Love the pails ! Great idea and so handy ! 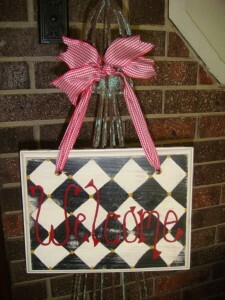 Love your “welcome” sign and how you have it displayed on your front porch! And the tin pail transformation is so cute! I would love to be in your giveaway… and I really like the Bon Appetit Plaque. SO cute! Congratulations on opening your store! I love the candlesticks, the large rosette, the pinch bowl…um, can I mention everything? I really like the rosettes, such a cute item and the candlesticks! 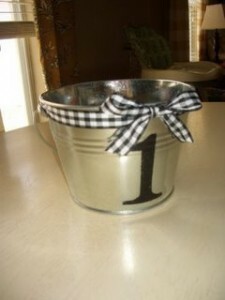 I adore the bucket with the initial! Great job! What a sweet giveaway! Love the initial pail! I’m off to check out your shop! cute stuff! LOVE the Welcome sign!!! ADORABLE! Love your blog and Etsy items. Also, love the cute little bucket makeover. Will have to try that. I love the adorable bucket idea. I will be looking for some tin buckets at the Goodwill from now on. Thanks for sharing. Forgot to tell you that I visited the store and I like the pinch pot with the heart in the middle the best. Congrats on your etsy store opening. I love it!!! So adorable. And your shop stuff is great, I can’t believe you make those rosettes! You will do great! Your store looks good! 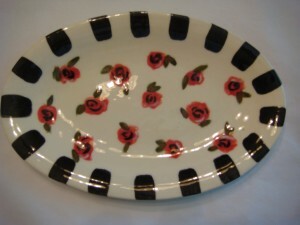 I like the rosettes, the soap dish and the frame the best. I guess that’s pretty much everything! Best wishes with your new endeavor. I love it…it’s just my style! I am so happy when my thrifty side and my creative side get together to create something beautiful…what a great feeling! 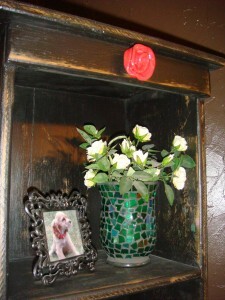 Oh, and the heart picture frame is my favorite (on your etsy site)…it’s simply darling! How cute! I loved everything i saw in your store….especially the Welcome sign! Very good work! I’m not talented at all…so i tend to appreciate other people’s good work like that! Good luck with your Etsy venture! I love the soap dish and the little candlesticks. Love what you did with the bucket! You’ve inspired me to do something like that for my school room. I also really like your clay creations! I went to your store and had to tell you the pinch pot is adorable! I decorate my kitchen black, cream, and white so of course the color caught my eye. I love the idea for the tin! May just have to try that myself! I would love to be entered in your drawing. I checked out your site and loved the “bon appetit” plaque or the welcome plaque. Both are cute and add a warm touch to any home! I found you via the Mr. Linky party as well. That bucket turned out SOOO cute! I’m going to check out your new Etsy store. I love that site and probably spend too much money there! But, it’s all good for the economy and supports indie businesses! Congrats on the new store. Cute finds & remakes. What a fun little project. I MUST need an adorable bucket for something, right? I am new to this blogging world and I love your site. You gave me a great idea for my old tin. Love the etsy store! I am redoing my porch and would love to have a welcome sign. Hi, I came across your blog through the Goodwill party. I love the “welcome”sign. I think that it is my favorite item in the store. Have a great day! I also came across your site from the Goodwill party. 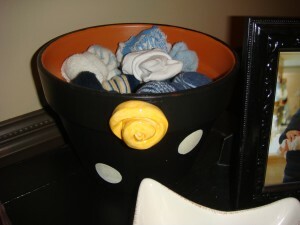 I love the little rose clay rosettes and the petite yellow candlesticks are adorable! Your welcome sign would give my front door a truly polished look! Congrats on your new undertaking!! Before I even knew there was a prize, I was going to comment. I love, love, love the rosettes! I am the proud owner of 2, infact! So glad you girls are doing the etsy shop! Wonderful, as always!! You have some lovely items in your shop. I think the rosettes are so cute. I would love to win the Welcome Sign. Would love to win. Cute things!! 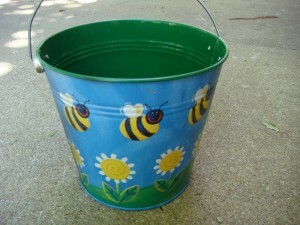 Cute bucket makeover! I visited your new store and I love the welcome and bon appetit signs. How incredibly cute…I’m thinking I might need to head over to Target for a bucket…unless I use the beer bucket that has the dog leashes in it…put His initial on it…hmmm. The candlesticks…adorable…bright spot of color. So cute…. I haven’t checked in a few days (sorry). I missed so much! I love the spray painted sticks. It sounds so rustic yet in your house it looks so put together and dare I say elegant? Way cool. And the spray painted buckets. I saw the $1 buckets at Target but they didn’t have the plain ones. They had stuff on them and I just wasn’t into it. Why, oh why didn’t I pick them up knowing that you’d have a great idea for them. Darn it! Ohhhhh! Pretty. I’ve been looking for one of these for when our house is finished. 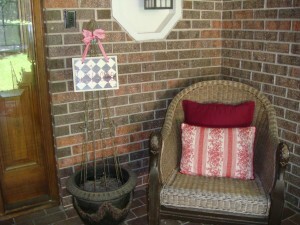 It would be adorable on our porch to welcome our guests. Here’s to hoping…!! p.s Love your blog, by the way. I get some great ideas from it!